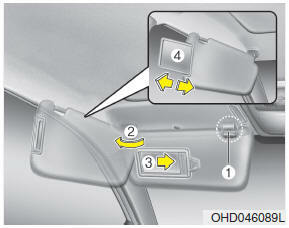 To use the vanity mirror, pull down the visor and open the mirror cover (3). The ticket holder (4) is provided to hold tickets such as tollgate ticket. • Always have the switch in the off position when the vanity mirror lamp is not in use. If the sunvisor is closed without the lamp off, it may discharge the battery or damage the sunvisor. • Always use the sunvisor extension, after swing the sunvisor to the side.